I first saw Jennifer Chastain in the film Miss Sloan (I would love to do a film review of this as well soon). I didn't know her prior to this so I was wondering how would the film go with my taste. I liked the poster and the trailer so I decided to watch it. 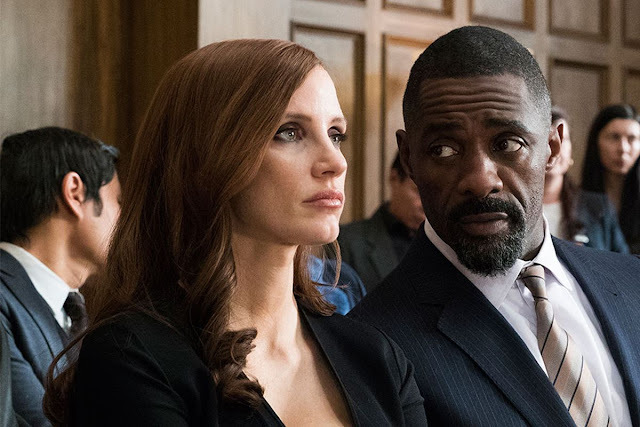 I was blown away with the story and with her acting that seeing her here in Molly's Game made me want to watch the film even more. I love her in roles portraying a confident character. Although the same in that area of confidence, this movie had a hint of weakness. Molly was a hopeful Olympic skier with a demanding father who never showed loved and recognition even in her triumphs. She failed miserably as a skier (not her fault) and we lost track of her parents from thereon. It was all her from this point of the the film, except when her dad makes an brief entrance again near the end. After failure, she rose up and worked odd jobs until she was introduced to a high level poker game. It was proven such as a success until she was fired and again a failure. She regarded the poker game as an opportunity so she proceeded to create her own. This proved successful again until it was taken away from her. Failure did not deter her and she simply set up shop in another place which proved to be successful again. 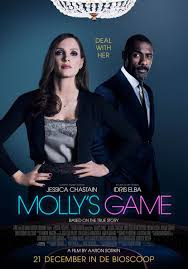 A very relentless character, this Molly Bloom is truly a personification of resilience. A very character that Jennifer Chastain has been able to portray flawlessly in this film. She was arrested finally for running an illegal gambling business and the film ends with her admitting guilty. Idris Elba is a suave handsome actor (im rooting for him to be the next James Bond) and he does not look like a lawyer. He portrays Molly Bloom's lawyer and boy he doesn't look like a lawyer, I have to state that again. He is overpowering to be casted as a lawyer. Not that he can't play it great, it was too easy for this guy. He has to play under Molly's character so he should be playing second fiddle, which he can't do. His acting here comes at par with Jennifer Chastain's that in one part of the film, we forgot about Jennifer Chastain was in the same room in that scene. Talk about his power to take over. Sadly there were just a few scenes of the lawyer in the film that stood out and it wasn't Elba's fault. Its just the story. As a side note, I liked his daughter in the film making cameo entrances breaking some of the ice to make it more interesting, that I attibuted to the greatness of Aaron Sorkin. Kevin Costner. In his early years I only like two of his movies, Bodyguard and Dances with Wolves. Thats it. What I don't like about his early years was his shoddy acting. He was and is still gorgeous and it overshadows his acting. His acting is similar to all his characters that it gets so boring. Now when he got older, he got wiser (?) somehow and we noticed his change in acting style. It was in The Guardian in 2006 that we first took notice. His acting is still the same from 2006 till now, the difference now? He plays the characters well now that we the viewers can really relate to. Kudos to him for being a normal dad here with a twist near the end. Great job Kevin. Now Aaron Sorkin as the director and writer. I only knew about him when he made the TV Series "The Newsroom". He was the creator of this wonderful series, too bad it ended on its third season. His style of writing is detailed so expect every scene to be meaningful and deep. So expect no less here in Molly's Game. He wrote also screenplay of the film based on Molly Bloom's book. He made each scene stand out that you have to pause the film if you ever want to go to the bathroom. That's how good the movie is. Overall, Sorkin weaved a great movie here using Chastain, Elba and Costner. I can always watch this one over and over. I bet heavily on this film and my gamble paid off. Thanks Aaron and the cast for making this a must watch film.